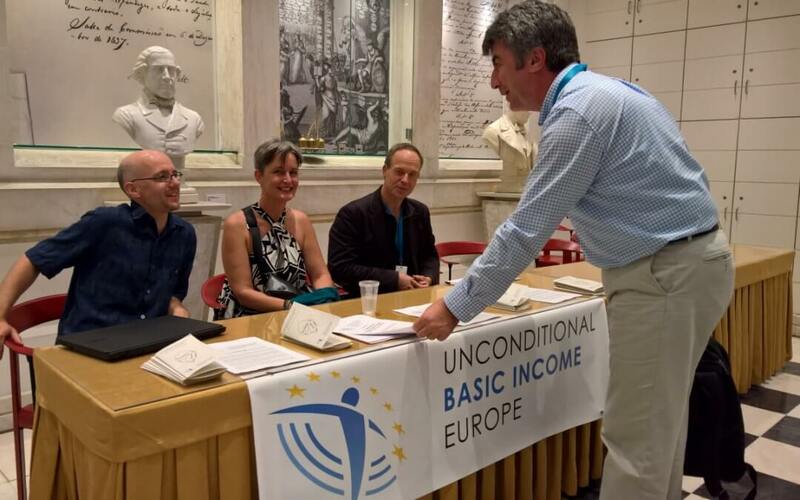 The 17th BIEN Congress in Lisbon (25th-27th September 2017) was the first to be connected to a General Assembly of Unconditional Basic Income Europe (UBIE), which took place also in Lisbon. Both events presented a great opportunity for members of both organisations to get to known to and learn from each other. UBIE had a stand at the Congress and also organised a workshop on cooperation between researchers and campaigners. At the BIEN Affiliates’ Plenary, our work and achievements were presented by Dániel Fehér, Chair of UBIE. It is an honour to address this distinguished audience on behalf of the board and the members of UBIE. My name is Dániel Fehér, and since March I am the Chair of this organisation. I stand here today to stress the special significance of a good, intensive and trustful cooperation between UBIE and BIEN. As many of you might know, UBIE was born out of the European Citizens’ Initiative that collected 300,000 signatures across the EU in support of basic income. This campaign was initiated mainly by individuals and organisations from the BIEN nexus. All of those who helped to start UBIE were enthusiastic supporters of the idea but not many of them were seasoned campaigners. Therefore the organisation is still trying to figure out what it means exactly to be a political interest group and how to do it best. All this without the financial and human resources of established advocacy organisations. But we are on a good way, making steady progress. We have now over 300 members in over 25 European countries (including countries outside of the EU). Our newsletter reaches 4,000 subscribers and we have active communication on Facebook, Twitter and now also on Instagram. We just relaunched our website two weeks ago and have a microdonation platform on OpenCollective. Beyond this, we are undertaking strong efforts to find out more about the interest and motivation of our members as well as to establish permanent communication channels to the movements in all the countries we cover. Levy support in the EU institutions. Make UBI a hot topic in the mainstream world. Assert the feasibility of UBI proposals. Activate and grow UBIE while making it appealing, fun and friendly. Building alliences with politicians, organisations and institutions on European level. Clarify the UBIE brand: Who are we, what are we doing, what are we not doing? UBIE members have the opportunity to meet in person 3-4 times a year. This year we started experimenting with formats that allow for a stronger focus on advancing with our projects and activities directed on implementing the work plan. We had good experience with using the Open Space methodology for our Summer Create-athon in Ljubljana and at our meeting last Sunday here in Lisbon. Next year, we hope to be able to organise a big summer academy with sufficient time for both working sessions and informal activities. I would like to finish with a view words on successes of the basic income movement in Europe. There are some big achievements which are the joint successes of lots of actors and a few smaller successes UBIE can claim ownership. The big progress is of course on the aim of making UBI a hot topic in the EU. The ECI helped a lot to bring the debate to countries where there was practically no public discussion on UBI before. These discussions experienced an explosion with the Swiss referendum, the Finnish experiment and the campaign of Benoit Hamon in France. I think it is fair to say that our French friends from MFRB had a significant role in building the basis for the latter to happen. And I think our network helped the process to spread the debate about these exciting developments across borders. Today, basic income is one of the few progressive ideas in Europe that is actively being discussed in most countries – including publicity in mainstream media. We made a contribution to the European Commission’s public consultation on the EU’s Social Pillar and presented our views at a conference of the European Economic and Social Committee. We were invited to a hearing at the Council of Europe to give I input to a report on the future of the welfare state. The report is due to be voted soon and is likely to contain a strong focus on UBI. We lobbied Members of the European Parliament to add a reference to basic income in a recent report on Robotics – we lost the final vote only on a small margin but made great contacts during these efforts. We are preparing joint events with Members of the European Parliament who support us. We got the European Green Party to set up a Working Group on UBI. We organised an expert workshop on basic income ideas in Ljubljana with the European Liberal Forum, the results of which will be communicated to the liberal group in the EP. As you can see, this is an exciting time to be a basic income activist. 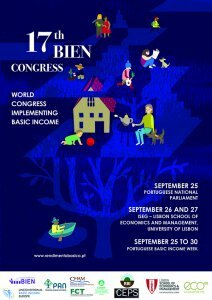 My personal expectation is that the topic of this BIEN Congress “implementing basic income” is on the brink of a major breakthrough, it could become political reality faster as we may think. But it will not happen by itself. And to make sure that it happens in a way we would like to see it happen, we need to be present in the political debates and steer them in the right direction. And that brings us back to the need of cooperation between researchers of basic income and political activists. We just had an excellent workshop on this subject. If we want to see basic income implemented, we need both qualified academic discussions and professional political advocacy. To help both, it is highly important to create a smooth and fruitful cooperation between UBIE and BIEN and we are here to make sure this happens. For UBIE, the BIEN framework is also an excellent opportunity to exchange campaigning experience with groups outside of Europe – we will continue doing that in a further session this afternoon – and of course beyond this Congress in cooperation with the BIEN Outreach Team. And we are happy that the next BIEN Congress in Finland will be another event where members of BIEN and UBIE can meet and continue to exchange.